If you’re searching for a vehicle that’s rich in comfort, safety, and performance, the 2019 Honda Insight is the sedan for you. At Manly Honda, we have luxurious new cars for sale, among them the modern and elegant 2019 Insight sedan. At our new and used dealership here in Santa Rosa, CA, we have the all-new 2019 Honda Insight available in a myriad of sleek colors and styles. We encourage you to stop by and see what the hype is all about! Our expert staff is ready to answer all of your questions and take you on a test drive so you can experience the 2019 Honda Insight for yourself in all of its glory. Our full-service dealership invites you to test drive the 2019 Honda Insight and experience its seamless performance. With its flowing, sculpted and aerodynamically-inclined exterior shape, slicing through the wind in the Insight will be effortless. In this sleek sedan, you will receive all the information you need at a glance within the driver information interface which is made up of a wealth of data including trip information and real-time energy flow from the battery. Plus, with the push of a button, you’ll be able to switch from ECON to Sport mode or from Park to Drive without hesitation. Take on the road with confidence in this innovative, secure sedan boasting several safety components that kick in as you maneuver your vehicle. Some of the available driver assistive technologies include Collision Mitigation Braking System™ (CMBS), Adaptive Cruise Control (ACC) with Low-Speed Follow, Road Departure Mitigation System (RDM), Traffic Sign Recognition (TSR) and Lane Keeping Assist System (LKAS). At our Honda dealership, you can expect nothing less than quality when it comes to vehicles that support your safety on the road. As impressive on the inside as it is from the outside, drivers and passengers will enjoy the sporty, yet elegant look of the Honda Insight. The dash and instrument panel include soft leather and fine double stitching, which add elegance to its overall design. These exquisite details really set it apart from other models making it a luxurious option for many individuals. Also, the rear seats fold down giving you several configuration options, which is great for road trips. The 60/40 split rear seatback folds down making it simpler to pack those extra-large items and its trunk offers almost 15 cubic feet of storage capacity. 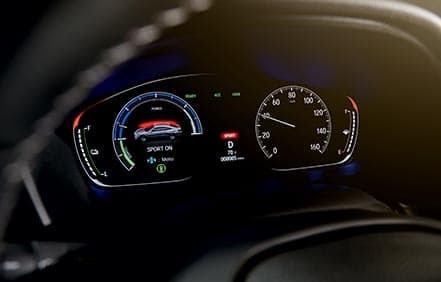 The 2019 Honda Insight sedan offers upscale touches such as the door panel illumination feature which always gives you interior visibility. Both the driver and passenger will enjoy the available power seat with a total of 8 adjustments to maximize comfort. Pair this with the available 160-watt audio system equipped with 6 speakers and you’re looking at an energy-filled riding experience. Among our new Hondas for sale, this is sedan of magnificence and innovation that is popular among many. With the 2019 Insight, you’ll be steering in style and turning heads on every corner, so feel free to visit us at our dealership near Rohnert Park today to enjoy it in your scheduled test drive as well as learn more about the new Hondas we have for sale!